hope you might also. These topics were probably just run of the mill stuff that a regular planetary science student or even a long time amateur astronomer would know, but I found it new and interesting. So, for example did you know anything about asteroid families or about how hydrocarbon oceans might flow on cold moons, like Titan, and how you can tell what the oceans are made of? Well, let's take a look at these topics. The first thing is to mention the OSIRIS-REx spacecraft mission, which was just launched last month on its journey to the asteroid Bennu. The spacecraft will go into orbit around Bennu and study it for about two years, starting in 2018, and then swoop down low enough for a robotic arm to grab a piece of the asteroid and return it to Earth sometime in 2023. Now that is pretty neat! Bennu is a small asteroid, only about 492 meters in diameter, and has been tracked by radar, mostly I guess by Arecibo. The neat thing about Bennu's orbit is that is severely impacted by non-Newtonian gravitational forces, called the Yarkovsky effect. Now, I had heard of the Yarkovsky effect before and it was neat to review its origins again. Mostly we think of the orbits of asteroids and planets as being determined by and described by Newton and the orbits six Keplerian elements. But asteroids in the 10 centimeter to 10 kilometer size range are also effected by forces originating with the solar radiation. The effect comes about for rotating objects because the absorption of solar radiation and its re-radiation in the infrared is not completely symmetrical and the thermal inertia of the asteroid is enough to shift the momentum change from absorption of photons and the radiation of infrared photons such that there is a net force on the asteroid. For asteroids rotating in the same direction as the orbit, the net force is to cause the orbit to enlarge and for retrograde motion, the net force causes the asteroid to spiral in closer to the sun. This effect, though quite small, is enough to perturb the orbits of asteroids and needs to be accounted for in order to be able to predict the path and future Keplerian elements for the orbit. The effect is too small to affect larger planets. There is also a second order effect of this change in momentum called the YORP effect. This second order change affects the rotation rate of the asteroid. The "Y" in YORP is of course for Yarkovsky and the rest of the term represents the other discoverers of this effect. Along this same topic of changes in the orbits of the asteroids another interesting topic is that of "asteroid families". Now, I knew of different names for groups of asteroids but had no recollection of why they are in families. 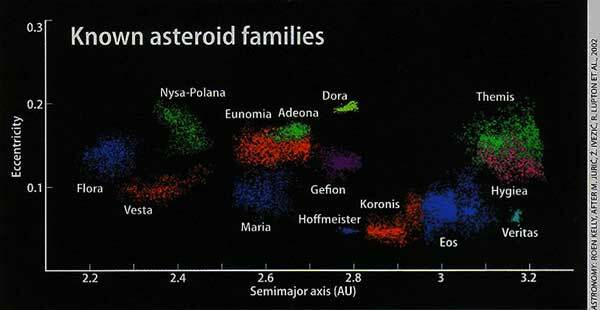 A good introduction to this topic is a chart from Wikipedia and Astronomy Magazine which shows some of the families. Several AAS presentations talked about new methods of analysis of the proper motion of asteroids in these families and how when those paths are backward integrated you get to a common point that is thought to be some earlier impact, which created the family members. Studying these families and their collisional history goes a long way in helping to explain the overall cause and history of the main asteroid belt. There was another great presentation of some of the recent findings from the Dawn mission that has orbited the asteroid Vesta and is now completing its orbits around Ceres. The Dawn orbiter carries a variety of scientific instruments to remotely image and examine Vest and Ceres, including a gamma ray spectrometer. Recall, that we last posted about how the gamma ray spectrometry is used back in October 7 and February 26. 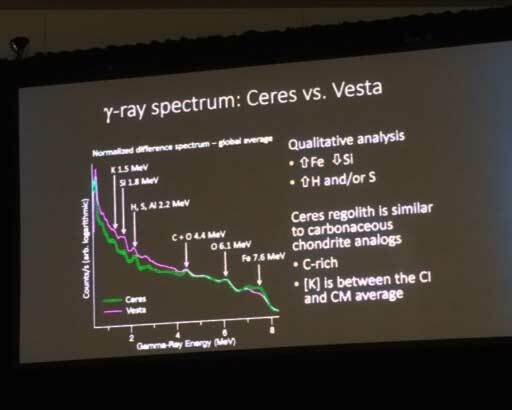 See how the various elements in the asteroid surfaces can be detected and how Vesta and Ceres have differing amounts of metals, which suggests some variation in their formation history. The other main topic of special interest was the measurement and identification of the properties of oceans on some of the cold and icy moons, like Saturn's moon, Titan. 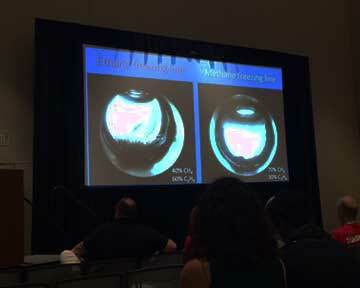 I wondered how astronomers can tell anything about the nature of these oceans and sat in on some of those sessions. Again all data about the oceans on these cold moons comes from remote spectroscopic observation, some from spacecraft and some even from ground based telescopes. What often is missing is information about how to interpret the spectrum and determine what one is looking at. Now on Titan, and other cold moons, somewhere in the neighborhood of 70 Kelvin, many hydrocarbons like methane and ethane can be in liquid form or in ice form. So, what these researchers at Lowell Observatory are doing in the lab is cooling various mixtures of hydrocarbons, and nitrogen, to the cold temperatures representative of the cold moons and observing the spectrum under laboratory conditions. This enables comparison and identification of the composition of the icy oceans on these objects. Oops, it seems my camera image is not too clear, but live it was possible to see little icy spindles and fingers in the image and then the laboratory spectroscope could be directed to examine the various locations and identify what the spectrum looks like. So, when scientists say that the oceans are made up of certain combinations of hydrocarbons we now see how the remove observations are correlated with measurements made in the lab.